This week’s Hindsight Fashion is: Frankenstein Boots. Frankenstein Boots (any black leather boot that is extremely clunky, generally with a very tall platform sole and buckles or laces) were a trend that surfaced in the 1990s and originated in the Goth Scene. Most often, the boots were paired with a short skirt and fish net stockings, although the style was also often seen with wide leg pants worn over the boots. Frankenstein Boots were worn for a couple of reasons: 1) They identified the wearer as belonging to a subculture, namely punk rock or goth. 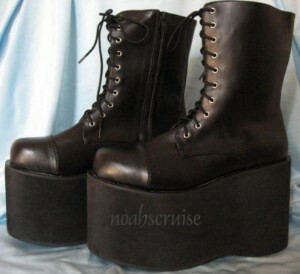 2) They made the wearer significantly taller, since the platform soles were so high. The boots were worn most often by women, but they did have some male proponents as well. I remember in my high school one gentleman who smoked odd smelling clove cigarettes whom the general populace deemed “most likely to flip out and harm fellow students in a large-scale effort”. Frankenstein Boots were extremely heavy. Walking in them was like dragging blocks of cement from your ankles. Any lengthy travel was immediately ruled out unless the wearer wanted to incur premature arthritis. For this reason, they were extremely impractical. It makes sense then, that I, lover of all fashion impracticality, would have worn the boots for several years in a row, including during a stint at Christian Sports Summer Camp in the wilds of Muskoka (pictured above) (That’s right. I wore that outfit at Christian Summer Camp). At some point at the end of the 90’s, our legs got tired of dragging these hunks of leather around and the trend moved toward a slimmer, more flattering boot heel. Though the current styles may not be as badass as the original, my ankles are pretty pleased with the relief. Probably a wise choice. These boots were killers! Is it a bad thing that the first thing I said after seeing that picture was “Woah, AWESOME”? Ha ha, well as long as your ankles can handle them, then I say more power to you 🙂 Rock those boots, girl!